Julia Louis-Dreyfus speaks with reporters on the red carpet for the Mark Twain Prize for American Humor ceremony, held at the Kennedy Center in Washington, D.C. The veep was at the Kennedy Center last night. Well, I'm talking about HBO's "Veep," Julia Louis-Dreyfus. She was in the nation's capital to pick up the Mark Twain Prize for American Humor. And some big names in comedy joined her there, as NPR's Elizabeth Blair reports. ELIZABETH BLAIR, BYLINE: Julia Louis-Dreyfus grew up in Washington, D.C. She went to Holton-Arms, the same private high school as Christine Blasey Ford, the woman who accused Brett Kavanaugh of sexually assaulting her 36 years ago. It was Tina Fey who made the connection. FEY: ...Playing Devil's Triangle with her girlfriends. BLAIR: But Fey also talked about being in awe of Louis-Dreyfus. FEY: It's her ability to appear completely effortless and natural on the surface while being a stone cold machine of timing underneath it. Julia is a Terminator robot of comedy. JULIA LOUIS-DREYFUS: (As Elaine Benes) I met this lawyer. We went out to dinner. I had the lobster bisque. We went back to my place, yada, yada, yada. I never heard from him again. JERRY SEINFELD: (As Jerry Seinfeld) But you yada yada'd over the best part. LOUIS-DREYFUS: (As Elaine Benes) No, I mentioned the bisque. BLAIR: Comedian Kumail Nanjiani loved watching Elaine on "Seinfeld." KUMAIL NANJIANI: It's really impressive to see how she's been redefining herself as a comedian and an actor over the decades. 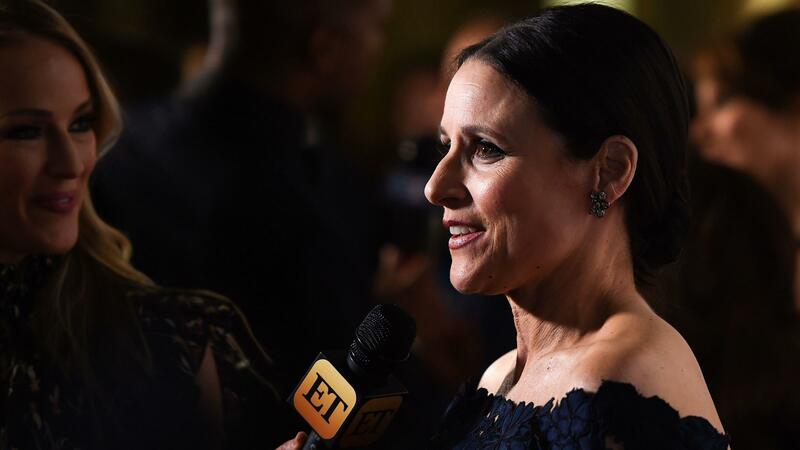 BLAIR: Julia Louis-Dreyfus has won 11 Emmys, including six for "Veep." Her character is ambitious, high-strung and not very savvy about social media. LOUIS-DREYFUS: (As Selina Meyer), Why are you even here? TIMOTHY SIMONS: (As Jonah Ryan) Oh, I came here to tell you that you're a meme, ma'am. LOUIS-DREYFUS: (As Selina Meyer) I'm a meme-ma'am? What are you talking about? Speak English boy. SIMONS: (As Jonah Ryan) A meme, an Internet phenomenon. ANNA CHLUMSKY: (As Amy Brookheimer) Oh, OK.
BLAIR: Among others honoring Louis-Dreyfus was "Veep" cast member Tony Hale, who plays her fawning assistant. He said it's been a privilege getting to know her creative process, the way she works with writers, and her commitment to finding the right joke. HALE: ...When I couldn't stop laughing during a scene. And she turned to me, and she said, Tony, you know, you're not watching the show. You're in the show. BLAIR: Julia Louis-Dreyfus has been performing since she was a child. She did theater in high school, then at Northwestern. She was in an improv theater group in Chicago that was invited to join the cast of "Saturday Night Live." It was a brief and not very successful stint. But it's where she met Larry David, who went on to create "Seinfeld." Jerry Seinfeld said he liked working with Louis-Dreyfus so much, he barely needed to act at all. SEINFELD: I could not get enough of her. I never said or did anything inappropriate. But that whole time - nine years - I was not acting. I couldn't. BLAIR: Last year, Julia Louis-Dreyfus was diagnosed with breast cancer. Accepting the award last night, she said everybody needs laughs. LOUIS-DREYFUS: So the fact that I've had the opportunity to make people laugh for a living is one of the many blessings that I have received in my life. 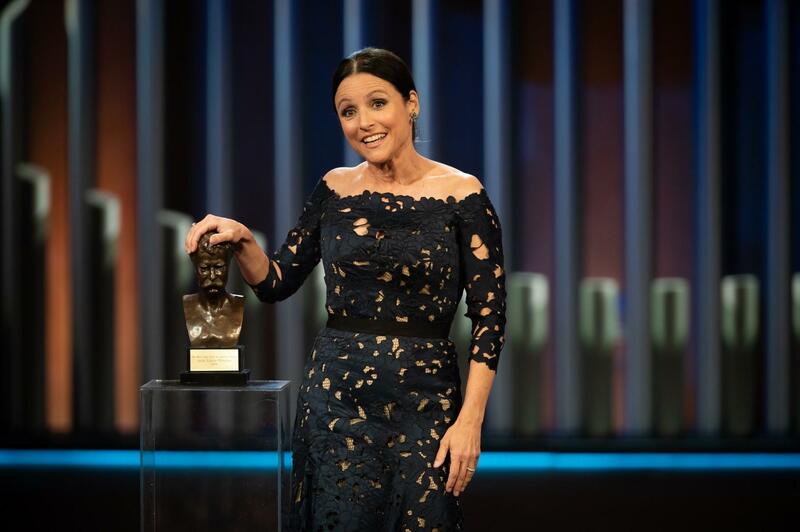 BLAIR: A telecast of the Kennedy Center's Mark Twain Prize for American Humor airs on PBS next month. Elizabeth Blair, NPR News, Washington. Transcript provided by NPR, Copyright NPR.